CHASING FOOD DREAMS: Ti Chen, The Saujana Hotel Kuala Lumpur: Mid-Autumn Mooncakes with a Dim Sum Treat! 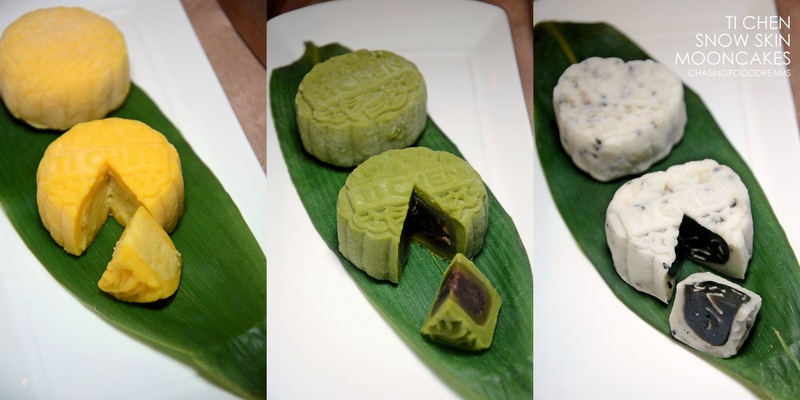 Ti Chen, The Saujana Hotel Kuala Lumpur: Mid-Autumn Mooncakes with a Dim Sum Treat! Mooncakes and Dim Sum Makes a Fabulous Pair! More mooning over mooncakes landed at The Saujana Hotel Kuala Lumpur at the Ti Chen Chinese Restaurant recently. If you haven’t been to Ti Chen Chinese Restaurant before, do head over to the restaurant located in The Saujana Golf & Country Club. One does not need to be a member of the club to enjoy a scrumptious meal at Ti Chen. This Mid-Autumn festive has Master Chef Lai Chong Seng together with Dim Sum Chef Yau Kim Yew churning out delectable and decadent moon cake series at The Saujana Hotel Kuala Lumpur. Ti Chen, known as ‘Emperor’s Palace’, serves fine Chinese dishes and dim sum on daily basis. The restaurant is beautifully decorated with bold red, black and white interior design and overlooks a gorgeous view of the green golf course. We visited Ti Chen on a bright and sunny Saturday for a dim sum lunch with a moon cake preview. The event kicked off with Dim Sum Chef Yau giving us 101 makings of Ti Chen’s Mini Snow Skin Mooncakes. All mooncakes are made at the restaurant. Though the list of mooncakes may not be as long as others, guests are assured that the flavors are truly unique with premium quality ingredients. Chef Yau presents three Mini Snow Skin Moon Cakes this year with the Durian Custard (Musang King) Mooncake taking the lead. This is followed by Almond with Black Sesame Paste Mooncake and Green Tea with Citrus Red Bean Mooncake. 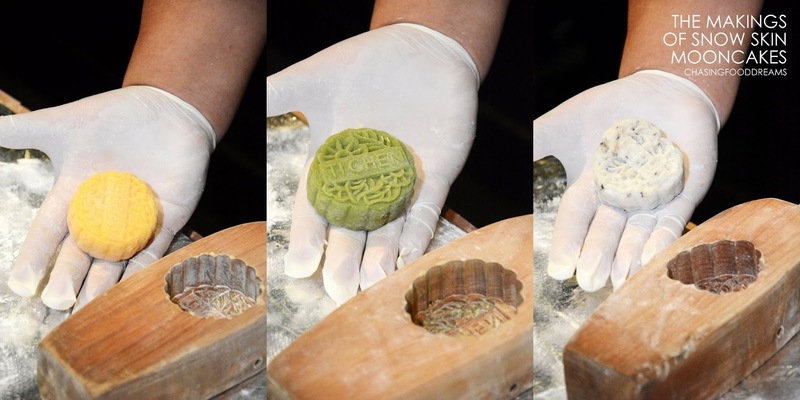 There is quite a few tales behind mooncakes. During the demonstration, Chef Yau mentioned that he had crafted the three Mini Snow Skins to represent different folklore of the mooncake. The round shaped Durian Custard (Musang King) Mooncake represents the Ming revolutionary’s overthrow of Mongolian using mooncakes stuffed with hidden messages of conspiracy while the oval shaped Green Tea with Citrus Red Bean Mooncake symbolizes the folk tale of The Lady of the Moon (Chang Oh) who stole and consumed an immortality pill from her husband the Great General Hou Yi and the heart shaped Almond with Black Sesame Paste Mooncake with the tale of The Old Man of The Moon (Yueh Lao Yeh), who is said to keep a book of records with all the names of all newborns and their future partners. After the demonstration, we checked out Chef Yau’s list of mooncakes available this year at the hotel. Exquisitely packaged in a gorgeous and elegant limited edition gift box available in 2 collectable designs of complete red or a combination of red and black, the gift box are classy and at the same time practical in transporting or carry the mooncakes. One can also use the gift box as a wine carrier once the mooncakes have been consumed. 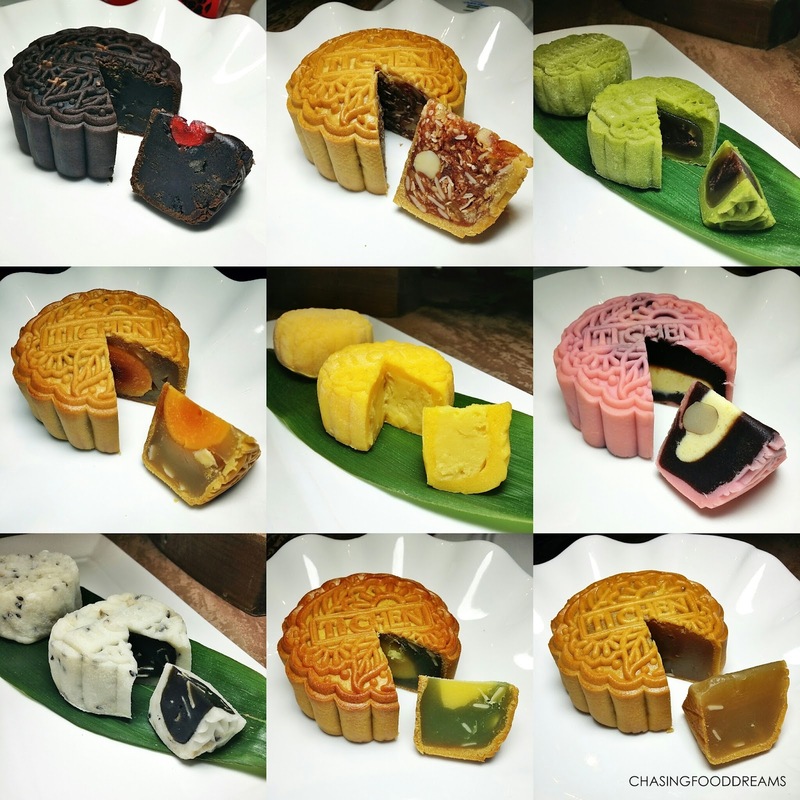 There are nine varieties of mooncakes available – six Traditional Homebaked and three Mini Snow Skin on the order list. Two modern flavours of German Black Forest Mooncake and Azuki Milk Mooncake make its debut in the baked series together with classics of Low Sugar White Lotus Mooncake, Low Sugar White Lotus Single Yolk Mooncake, Jade Custard Mooncake and Golden Mixed Nut Mooncake. Out of the baked series, the two modern flavours really stood out. The bittersweet dark chocolate German Black Forest Mooncake is utterly heavenly and is studded with sweet cherries. The Azuki Milk Mooncake has a creamy and nutty flavour with red bean paste enrobing milk custard in a pretty pink skin. The classics tasted very good as well and are not overly sweet as Chef Yau uses low sugar content in the mooncakes. All of them have a blooming sweetness that is just right to ring in the festivity. Out of the three Mini Snow Skins, I only tried the Green Tea with Citrus Red Bean Mooncake and Almond with Black Sesame Paste Mooncake as I do not like durian. I enjoyed them both as they are soft and filled with decadent green tea and almond with sesame flavours. The skin is soft and melts with a creamy sensation. 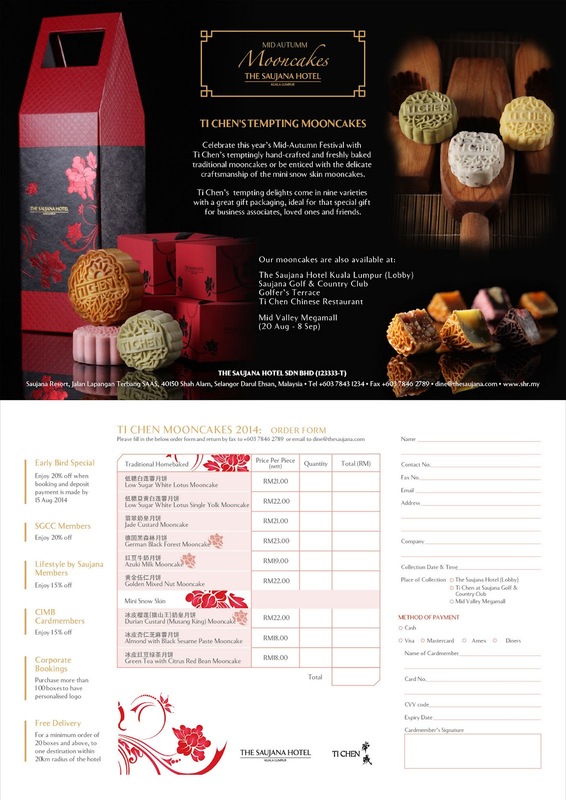 Ti Chen Mooncakes at a glance! Priced at RM 19 to RM23 each for the baked skin and RM18 to RM22 each for the snow skin, Ti Chen mooncakes are available from July 8th to September 8th 2014. SGCC Members get 20% off, Lifestyle by Saujana Members get 15% off and CIMB Card members also gets 15% off. For details of the Mooncake Promotion, go to www.shr.my – promotions or contact 603 7843 1234 ext 6122 or email dine@thesaujana.com. Besides mooncakes, Ti Chen is famous for their creative and scrumptious dim sums. Chef Yau makes premium quality dim sum using all natural ingredients and is very creative as well, lending flavours of authentic dim sum with a modern presentation. We dined on baskets of dim sum prior to savoring our mooncakes. Deciding on a favorite dim sum is hard as they are very delicious in their own ways. Steamed Chicken Siew Mai and Steamed Prawn Dumpling are simply a must here. I don’t know how Chef Yau does it but his dumplings have that gorgeous bouncy texture filling which I love to bits. It’s a sign of a superbly made dumpling. The flavours are spot on too with a lovely balance of savory and sweet. Deep Fried Prawn Roll with Jackfruit is unique and really refreshing and fruity. The pastry net is so light and crispy while the sweetness of the prawns paired well with the fruit jackfruit sauce. Thumbs up for the creativity! The Wok Fried Radish Cake with Seafood is a lux up version of my favorite street food. The big chunks of radish cake are soft and creamy. Flavoured with dried radish, garlic, soy sauce, chilies and perked up with juicy prawns and scallops, the radish cake is so yummy. Beansprouts, chives and egg completed the dish with more textures and flavours. Steamed Glutinous Rice with Chicken had just the right texture of sticky rice, firm yet tender and moist. There is such an air of quality in all Chef Yau’s dim sum and its no wonder that he has also garnered several accolades under his belt. There are certainly more varieties of dim sum available at Ti Chen, do head over there for a taste of dim sum and you might want to end your feast with their delectable mooncakes! For reservations, please contact 603 7843 1234 ext 6122 or email dine@thesaujana.com. Permisi... Ijin meninggalkan jejak yah :) Kali aja ada yang butuh Dus Makanan. Jadi bisa hubungi kami Greenpack.